Opportunities and challenges faced by gold enterprises under the revenue system of mining rights transfer Xu Chunwei;Wu Junqi;Pang Lu;Lu Shudong;Zhao Hui;China Gold Group Resources Co. 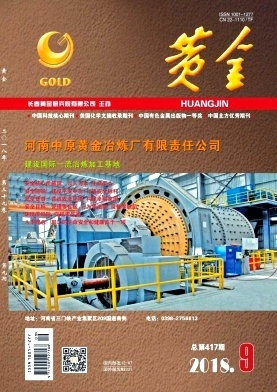 Experimental study on flotation of Kaldo converter smelting slag Yang Jing;Tian Jing;Ma Ruiyi;Ma Xigong;Comprehensive Utilization Key Laboratory of Gold Resources in Henan Province;Henan Zhongyuan Gold Smelter Co. Experimental study on selecting the plants fit to grow on cyanide tailings Liu Qiang;Ye Jinjuan;Lü Chunling;Changchun Gold Research Institute Co.
Study on the determination of gold content in thiosulfate gold leaching solution Gao Zhenguang;Liu Zhenghong;Guan Guojun;Du Zhaoxin;Meng Xianwei;Changchun Gold Research Institute Co.
Geological conditions and prospecting perspectives of Buchuk Gold Deposit in the Kyrgyzstan Yang Shuai;Yeernaer Bielike;Li Yuyang;Zhang Shun;Zhongji Mining Co. Renovation of upward horizontal slicing and filling mining method and its application Jia Xufeng;Zhao Long;Ren Shaoyong;Wan Bowen;Jiangxi Jinshan Mining Co. Practice on ground pressure control in deep mining of large-scale gold mines in Jiaodong Liu Huanxin;Wang Jianbo;Zhao jie;Li Guilin;Cheng Li;Deep Mining Laboratory Branch of Shandong Gold Mining Technology Co.
Optimization renovation of metallurgical process in a Kyrgyzstan copper-gold mine and its application Zhang Yanjun;Wu Xiaodan;Li Hong;Beijing Oriental Yanjing Engineering Technology Co. Experimental study on copper flotation of copper-molybdenum ores Li Li;Xiu Dawei;Cheng Xiaoxia;Yichun Luming Mining Co.